Many travelers dream of travelling to Tibet, and often, tight travel schedules make it difficult to include every destination into one trip! Tibet Ctrip Travel service-TCTS has introduced fully customizable Tibet tours for travelers on a tight schedule. Lhasa-based Tibet travel agency Tibet Ctrip Travel Service-TCTS is helping travelers on tight schedules to add Tibet to your itinerary! Tibet Ctrip now offers a lineup of 4-day Tibet tours that include various famous sites in Lhasa and around. Whether coming from Nepal or Mainland China, the quickest and easiest way of entering Tibet is by air. Travelers can fly into Lhasa, spend the evening relaxing and acclimatizing to the altitude, and then enjoy two days of sightseeing before moving onto their next destination. 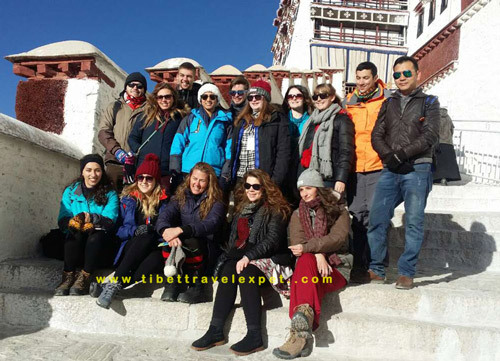 Tibet Ctrip’s tours can be customized to the unique interests and preferences of each travel group; several itinerary options are available! Travelers generally begin their tour with a visit to the famous Potala Palace, former home of the Dalai Lamas. Filled with towering stupas, ornate statues, and other cultural treasures, this sprawling architectural wonder captivates the imaginations of almost every traveler. After Potala, Jokhang Temple is a short walk away. This temple is one of the holiest Tibetan Buddhist sites. Outside the temple, travelers will see pilgrims from all corners of Tibet! On the second day, many travelers choose to visit Drepung Monastery, Sera Monastery and Norbulingka, summer palace of the Dalai Lamas. Another option for travelers is to visit Norbulingka, Pabongka Monastery and Sera Monastery on the 2nd day. On the 3rd day travelers will visit Jokhang Temple and Potala Palace. Those who choose to visit Tibet for its stunning natural scenery can also make a trip to Lake Yamdrok! Since Lake Yamdrok is at a higher altitude than Lhasa, it is better to visit Yamdroktso after spending time acclimatizing in Lhasa. An alternative option for exploring the countryside is to visit Drigung Til Monastery, Tidrum Nunnery with Hot Springs. This is a great way to combine learning about Tibetan culture with stunning landscapes! Even if you are short on time, you can still learn about its unique culture and get a taste of its stunning landscapes. Tibet Travel Expert is always happy to work with travelers who have a specific Tibet tour itinerary in mind. While the best times of the year to visit Tibet are in late spring and in early autumn, a tour focused on Lhasa can be arranged for any time of the year. Tibet has become easier to reach as well. At least 3 flights from Kathmandu arrive in Lhasa each week. There are also daily flights from many major Chinese cities. Don’t let a tight schedule get in the way of an unforgettable Tibet tour! Next postShopping in Tibet: What to buy? Where to buy? How to bargain?